Fab card Sylvie. Love the chandelier and the lace is gorgeous. Hola Sylvie, very elegant and sophisticate card, beautiful!. Love the black and white with the gems. Perfect. Very nice, and very elegant. Fab card Sylvie, love the lace so sophisticated! i can see your bling! Super card Sylvie... glad you like the challenge this week! Love the chandelier, the bling looks fab - gorgeous lace too. Love it! The content of your pages is reminiscent of elegant space and even better balls. Gracious. Very elegant. Enjoy the weather there's frost here tonight. Great card, lovely image and the lace and bling look fab. Very elegant and perfect in black and white! Beautiful. This is so elegant. Ann Y.
Sylvie, this is so elegant! I have a set of chandelier stamps, and haven't pulled them out in a while. Thanks for the inspiration! Also, you popped by my blog last week and became a follower and I wanted to say thanks for that, too! My hubby and I had been to Gibraltar once, on a trip to Spain. What a neat little country you have there!! Gorgeous chic card - really love it! Hope that you are well. Tilly sends you a big kiss!! 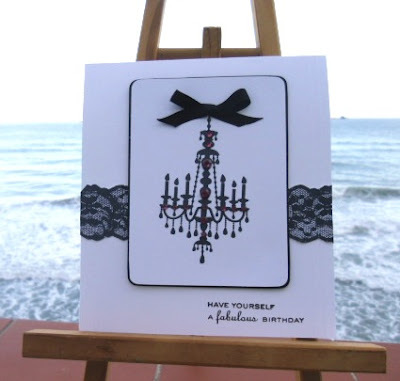 Sylvie...very elegant card you've created here! Love that chandelier image! I'm working on a scrapbook page right now that it would be perfect one! lOL! Beautiful card Sylvie and very elegant. I can see the bling, but it must be really beautiful in-real-life. You have good command on your hand as well as mind. That is the reason that you make this kind of pretty module. I appreciate you for making it. Your ability to ambrose the picture is really very good.